On the one hand, this behavior is so cartoonish as to be almost dismissible. From his entitled swagger to his Don Johnson–circa–Miami Vice hairdo, the 71-year-old Nastase comes across like a mascot for the patriarchy, the kind of guy any woman with her radar up for crude, boorish men would immediately avoid. But Nastase’s terrible, horrible, no good, very bad weekend capped off a banner year for sexism in tennis. First, in March 2016, there was the forced resignation of the director of the famed Indian Wells tournament, Raymond Moore, for saying that female tennis stars “ride on the coattails of the men” and that if he were born a “lady player, I’d go down every night on my knees and thank God that Roger Federer and Rafa Nadal were born.” Then came the assertion by Ion Tiriac, the Madrid Open director, that equal pay in the sport isn’t merited—though he hastened to add, according to the New York Times, “I like, very much more, women than men.… The longer the legs theirs are, the more beautiful I think they are.” And finally, there was the abundant testimony by male players that the wage gap in tennis—like American women, female players make something like 80 cents on the dollar compared to men—is justified because the women’s game is plainly inferior to the men’s. It’s “a different product, which is better,” as Ukrainian player Sergiy Stakhovsky put it. Both Novak Djokovic, ranked fourth in the world, and France’s Jo-Wilfried Tsonga, ranked tenth, graciously added that women can’t help it that they’re not as good as the men, what with their “hormones” and all. As for the uneven paydays, it’s not that female superstars like Serena or Maria Sharapova or any of the tippy-top tour players aren’t making a killing. They are. Serena earned $7.7 million in prize money in 2016 and is the highest-paid woman athlete in the world, having raked in another $19 million in endorsements this past year. But still, why should she earn less for defending her title at, say, the Western & Southern Open than her male counterpart at the same tournament? 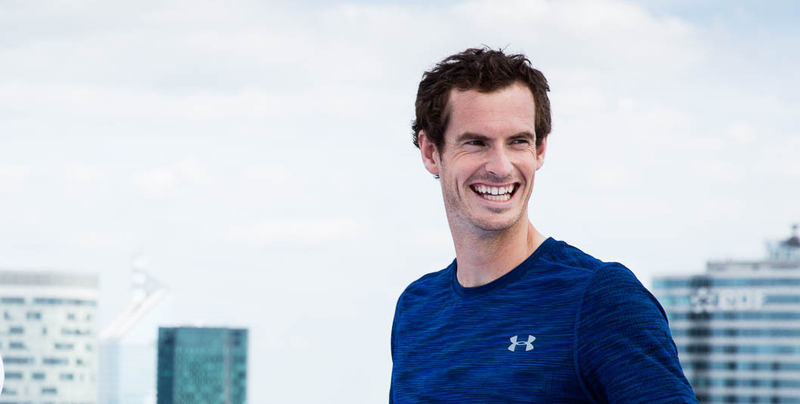 To hang out with Murray is to be treated to a relentless and relentlessly entertaining dance between his two personalities: well-bred British global-superstar athlete and gleefully profane Scotsman. He has won the prestigious BBC Sports Personality of the Year award three times and was knighted by Queen Elizabeth II at the end of 2016. Yet later, when we’re pulling into the Sánchez-Casal tennis academy where he used to train, Murray will gesture across the street and casually announce: “There always used to be prostitutes at the end of this road. Always. We had to walk past them to get the bus into the city…. And this stinks right here, this is a sewer—it’s sewage.” A moment later, he hops out of the front seat to open the entrance gate for our car. Perverse as it may be, there’s something about seeing a person—especially one known for prickliness—laid bare that endears them to even the most skeptical fans. “The pressure and expectation was a lot,” Murray says of those early years. “And the guys I was competing against, all of them would probably be in the top five of all time. It was actually when I accepted I might never [win a Grand Slam event] that things started to change a little bit for me.” Though “serene” is the last word you’d use to describe Murray, there is something metaphysical and monklike about him; he’s aware that it was only when he’d really internalized that he might not rise to the pinnacle of his sport that he loosened up enough to get there. Less than a month after that ignominious defeat, on that very same Wimbledon center court, Murray beat Federer, earning his first Olympic gold (and the first singles gold for Britain in more than a century). Five weeks later, he followed that win with his first Grand Slam title at the U.S. Open in September. The next summer, in 2013, a BBC documentary introduced a much wider audience to Murray’s droll-but-sensitive off-court personality—there is a several-minute bit in which he and his wife discuss the psychology of their two naughty dogs that is particularly charming. The film also included the first in-depth comments from the Murray family on their memories of the Dunblane shooting, which happened when Andy was 8 and Jamie, 10. Both boys attended the school where the massacre took place and knew both the victims and the assailant, who ran a local boys’ club and was someone the Murrays used to give rides to. “You have no idea how tough something like that is,” Murray said, tearing up in the biopic. “It’s just nice that I’ve been able to do something the town is proud of.” In July, shortly after the documentary aired, Murray won Wimbledon for the first time—and sobbed with happiness. Apart from his advocacy, Murray is known as a student and true lover of the women’s game. In Barcelona, he volunteers an argument to counter the oft-heard idea in tennis land that female players are more prey to their emotions than the men, the “proof” being statistics that can be interpreted to suggest that women are less likely than men to hold their serve at crunch time. But, as Murray explains, male players win more “free points” on the serve overall because of the greater velocity of their ball. “Women’s [serves] get broken way more than men’s in general, so obviously that’s going to happen more in big moments as well,” he says, sounding exasperated. As we’re driving out to visit Murray’s old tennis academy, where a court is to be dedicated in his honor, I’m reminded of how he almost makes a fetish of efficiency—the previous day, I’d watched him practice spot serving like a sniper practices target shooting, hitting the same dented tennis- ball can over and over. During the trip, he can’t stop extolling the virtues of Waze. “It’s by far the best app I’ve ever downloaded. It kills me when people don’t accept that technology knows more, when people are like, I’m going to take this road and that road, and I’m like, But this thing is giving you the fastest route!” Murray’s wife does all the driving, he says. “I’m not allowed to. She’s just not a great passenger, and it’s fine,” he explains, then breaks into a grin. “Until something goes wrong. Then I blame her. Then: the swarm. There are an imposing number of superphysical teenage boys—tall, lanky, and aggressive—in the house; one of them will convince Murray to hit with him on his way out. But there are also a fair number of girls, one of whom stands out. She’s small, maybe 10 or 11, dark-skinned, with a giant topknot ponytail spilling out over her scrunchie and a steely, determined way about her. She’s among the first to score an autograph: Murray signs the red tank top she’s wearing. As he’s rounding the corner to visit his old dorm, she somehow presents herself at the front of the pack once again, this time with a ball in hand, which he signs. And finally, as Murray is making his way to the car, there she is again, this time pressing a visor on him. After getting her third autograph of the day, she turns back to her friend, showing off her signed swag. Then she raises her fist to the sky triumphantly.